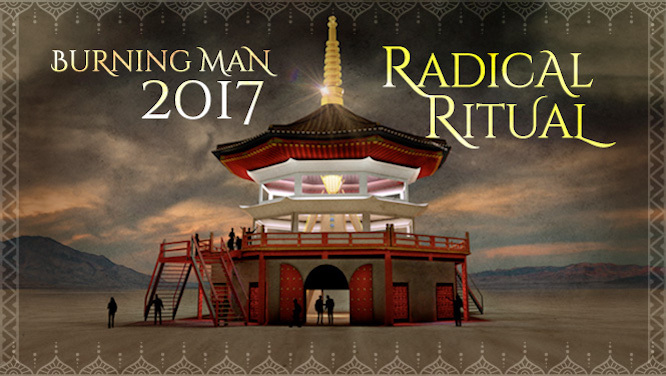 Burning Man today announced the theme of their 30th desert gathering: "Radical Ritual." The theme invites participants to thoughtfully release their spirits into the Black Rock Desert. Unique interpretations of " interactive rites, ritual processions, elaborate images, shrines, icons, temples, and visions" are highly encouraged, of course. Burning Man's annual themes give participants the framework to really explore a new terrain each year, and previous years explored concepts of heaven, Renaissance craftsmanship, astronomy, community journeys, class carnivals and our roles within that circus. In a noteworthy twist, the Man will not stand atop a traditional elaborate base. Instead, the Man will relinquish its usual spot to the "Golden Spike." For those who follow Black Rock City's (very interesting!) construction process, The Golden Spike marks the formal beginning of Burning Man. The Burning Man Department of Public Works (DPW) pounds a golden piece of rebar into the playa to mark the Man's exact coordinates. This gilded spike serves as the exact center of the city's infrastructure, and is subject to much fanfare. 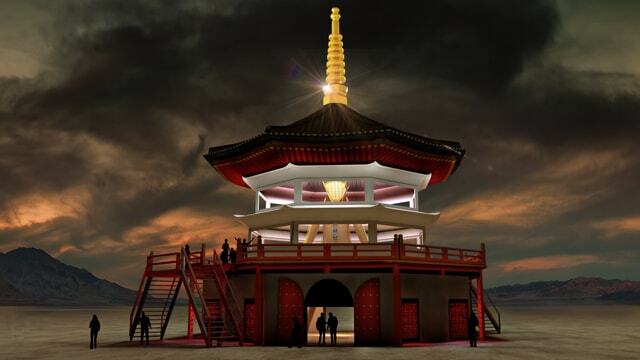 If we're seeing this right, Burning Man 2017 will see a Golden Spike in the Man's usual spot, the Man moved down and inside, and a Temple-like structure housing the two. Does this mean no other Temple? This dismantling of Burning Man's rituals goes to show that in Black Rock City, well... nothing and everything can be sacred at the same time. This theme of "Radical Ritual" ties directly to Fest300 co-founder Chip Conley's longtime mantra, an insight that maintains, "The more digital we get, the more ritual we need." This year's theme gives us the chance to really reflect on that, and create accordingly. Read below for the full theme, by Larry Harvey and Stuart Mangrum. This year’s theme is an attempt to reinvent ritual in our post post-modern world. For this purpose, we will disregard assertions of belief and concentrate instead on the immediate experience of play. Beliefs contain, define, and limit meaning. They can reduce truth to a rational commodity. But play can free us to envision truths of which we have no proof or warrant. Such play, as we conceive it, breaks down the distinction that divides belief from make-believe. Whole-hearted and creative play induces self-surrender to experience that is beyond the realm of reasoned thought. From the playful invitation to make angels in the dust that greets participants who enter Black Rock City, to the Temple Burn that signals its demise, Burning Man is permeated with rituals. These rites speak of soulful need; the desire to belong to a place, to belong to a time, to belong to one another, and to belong to something that is greater than ourselves, even in the midst of impermanence. Throughout all ages temples have been built in order to induce these feelings. When workers of the DPW, our Department of Public Works, arrive in the Black Rock Desert, their first task is to locate the exact position of the Burning Man, for it is from this very spot that our entire city is surveyed. A gilded stake of rebar is then pounded in the ground, and over many years this action has evolved into a ritual. Each member of the crew takes up a hammer, and with a single stroke, imparts an ounce energy that is confluent with their common effort; in some sense they’ve created Burning Man. This year we will erect a temple that will commemorate the Golden Spike. Circles surrounding circles will converge immediately beneath the Man. We will mark this space with an omphalos, a sculpture that will represent the navel of our world, its central hub and gathering place. Passing through the spine of Burning Man, this axis will continue upward, emerging high above the temple as a golden spire. Participants are invited to contribute to this shrine, and to the hundred niches that will it penetrate the temple’s walls. These offerings should be construed as gifts that will embody what our culture and its city means to you.